If this ain’t Black Girl Blues I don’t know what is. 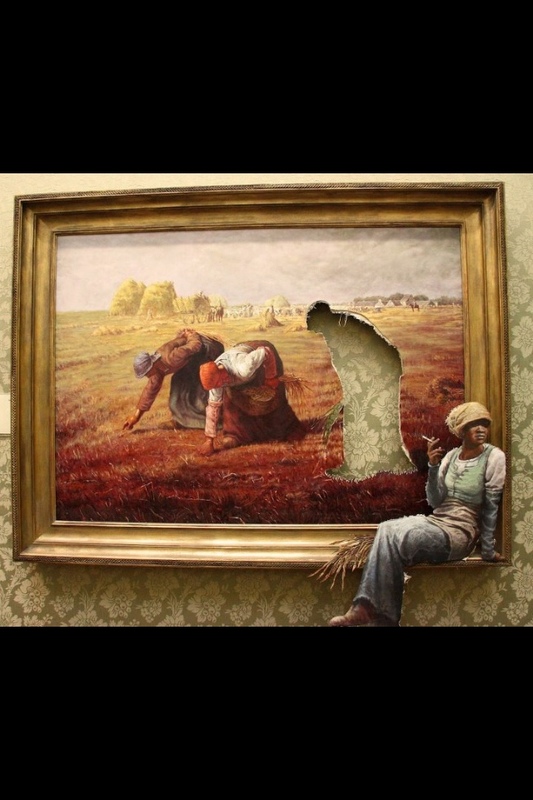 This is by Banksy who is a famous street artist in Bristol. Today I took I big leap. Today I signed up for online dating! I think it was while I was filling out my profile that I realized that it’s time for me to be honest with myself about what I want. For the last couple of months I have been praying HARD. And not just for any man, oh no, I’ve been praying for The Man. The One. The End All Be All. These prayers go something like this: God, you know my heart. You know what I want. And you know what I need. Lord I need a man that is God-fearing, loves family, respectful, intelligent and honest. Hard working and dependable. A man that is gonna help me become the best person I can every day. A man that is financially sound. And if he is tall, chocolate has all his teeth and job benefits that would be real nice too. But God you know all this. Just send me the man You have set apart just for me. The one You made with me in mind. Then I pray for Him to get this lust demon off my back and out my drawers but that’s another post. I have prayed this prayer many times over the last few years but never as diligently. I mean I pray for my soulmate at least 5 times a week. Sometimes I pray for him. I pray that God will bless him, protect his heart & know that I’m out here loving him and praying for him already. And I know that might sound crazy but it helps to remind me that God’s got it and whatever is meant for me is already mine. Including my Future Husband. Which is why I felt like online dating was disrespectful to God. Because I thought that if I tried it I would be telling God that I don’t trust that He’d handle it. But as I signed up I felt a calming peace that God works through ALL things, even online dating sites. After reading that I just feel emotionally overwrought, raw, wrung out and incredibly human. Sometimes in my attempt to be nauseatingly positive I forget to admit that sometimes life hurts. On its own, without any help from anyone else, the act of living is painful. Anyone that has lived can attest to this fact. Ocean’s letter is a testament to that. It is proof of that pain and the humanity of it all. He loved. He wasnt loved back. It hurt. Period. I’ve been there. I’ve loved with all the love I could muster at that stage in my life. And I’ve been loved, in a way. Sometimes I havent been loved the way I wanted. Sometimes it wasnt enough. Sometimes it wasnt at the right time. And sometimes love is poisonous. And in the end it hurt. But that pain helped me grow. So I understand when Ocean wrote “Thanks. To my first love. I’m grateful for you. Grateful that even though it wasnt what I hoped for and even though it was never enough. It was,” I overstand. You see I have a first love. We all do, but he is mine. I have loved him since I was 15 years old and I love him to this day. I cant shake him and he cant shake me. And what’s worse is that we have never really been together so we have never really broken up. We are prisoners, shackled at the heart, pulling in opposite directions, breaking both hearts in the process. And they will never heal until once or for all it is finished and we are free. Free to love or free to leave. Frank Ocean loved and lost too. He hurt too. Except his hurt was compounded in that it wasnt “acceptable”. I have been in some shady situations. I have been the love “a la carte” and when your feelings arent accepted no one will empathize with your pain. But no matter what they say, accepted or not, it continues to sting and bleed and fester and infect. It continues to hurt. Life hurts. All by itself and without any assistance. But it hurts so much more when people go out of their way to make it worse. They take that pain and throw salt in the wound. They take the smoldering remains and fan it and blow on it until the fire burns anew. They take an ax to the pieces of your heart that still have the audacity to beat. And they do it as if it has never or will never happen to them. 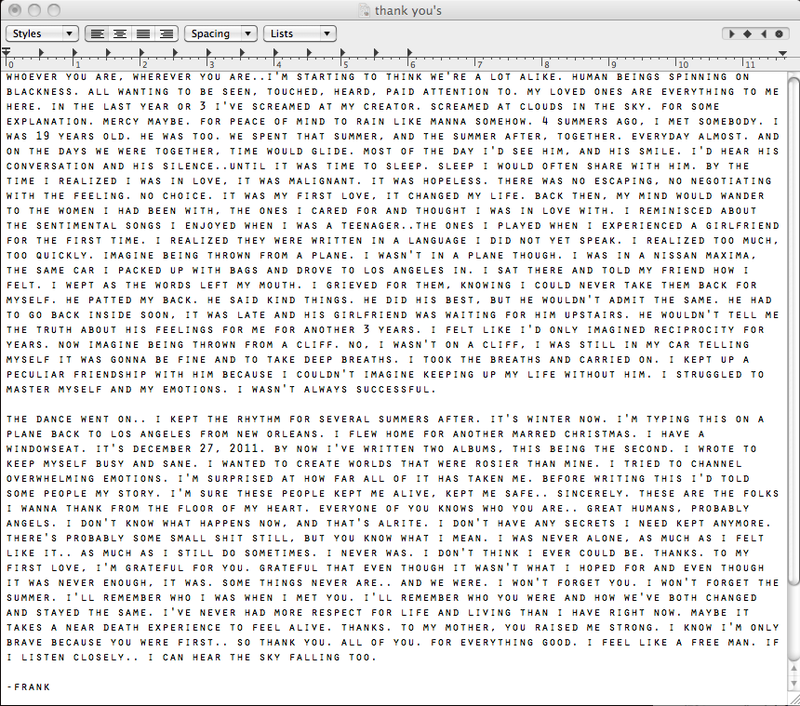 So I want to thank you Frank Ocean for your bravery. Your willingness to hurt out loud and in all of the living colors. From my hurting yet beating human heart to yours, thank you.